The Association of Retired Ramapo College Faculty and Staff Scholarship will be offered to one undergraduate student each year who has demonstrated concrete accomplishments in an unpaid formal leadership position within a Ramapo College recognized or registered student organization or within a Ramapo College governance entity such as the Board of Trustees or the Board of Governors. To be eligible, the applicant must have a minimum 3.0-grade point average in his or her studies at Ramapo College and must have completed a minimum of 30 credit hours at Ramapo College. Applicants will submit an essay limited to one double-spaced page naming their leadership role(s), their accomplishments in those roles, and how that work has affected their campus life. 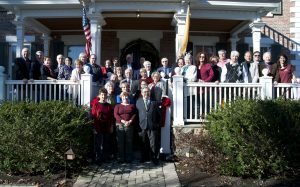 The award will be presented publicly at the annual President’s Holiday Luncheon for Ramapo College retirees held in December and will be publicized on the website of the Association. Victor Georgiev is an international student from Varna, Bulgaria and an Information Technology Management major. He has a cumulative GPA of 4.0 and has been on the Dean’s List since his first semester. At Ramapo, Victor serves as the President of the International Student Organization and has been active in the ASB Dean’s Student Advisory Council, the Beta Gamma Sigma Honor Society, the KPMG Mentorship Program, the Residence Hall Council, and the CCEC Teaneck Tutoring program. On campus, Victor works at the ITS department. Off-campus, he has gained experience working at IBM, Sutherland, and C3i Europe providing IT support to corporate and government clients. He plans to continue his education in IT and pursue a master’s degree. Erin McKenna of Midland Park, N.J. is a Business Administration major with a concentration in Marketing. She has a 3.87 GPA. She has been on the Dean’s List for six consecutive semesters during her time at Ramapo. On campus, Erin has been active in several organizations and activities, including the Student Government Association, Alpha Omicron Pi, and the Peer Facilitation Program. She currently works on campus at the Roukema Center for International Education, working closely with international programs. She previously held the position of President of the SGA where she inspired members of the Student Government and worked towards making a positive impact on campus. Currently, Erin serves as the Secretary of Delegate Affairs for the SGA, working with students interested in learning more about the organizations and potential future positions. She is also the Vice President of Chapter Development in Alpha Omicron Pi, where she organizes events that foster sisterhood and community. Erin has also been involved in off–campus activities and organizations, including the Wyckoff YMCA Teen Leaders Program where she participated in various community service projects such as Billy’s Buddies and Arthritis Awareness Walks. Achyut Gautam of Kathmandu, Nepal is a sophomore pursuing a major in Business Administration with a concentration in Finance and a minor in Mathematics and Economics. He is also enrolled in the college Honors Program and has a GPA of 3.91. He’s involved in multiple clubs and organizations on campus, including the Student Government Association (SGA), the International Student Organization (ISO), the Finance Club and the Civic and Community Engagement Center. “As a student of Ramapo, I am confident that I will continue to grow more confident as a leader, accomplish my academic goals, and learn different invaluable life skills,” said Achyut. In addition to his academic pursuits, he started working on a social venture to serve the communities of Nepal and plans to complete it by the end of 2017. Josef Weikl of Ridgefield, NJ is an Economics major and Mathematics minor. He has a 3.86 GPA and is a member of the Rho Alpha Sigma, Omicron Delta Epsilon, Beta Gamma Sigma, Chi Alpha Sigma, Golden Key International and Alpha Lambda Delta honor societies. At Ramapo, Josef is active in several organizations and activities, including RASA and the Student Government Association. He currently serves as the Student Trustee on the Ramapo Board of Trustees, and is a Resident Assistant in the College Park Apartments. Josef has interned for UBS Financial Services in Paramus, NJ and the Atlantic Baseball Confederation College League (ABCCL).